The Strange Music S.O.S. Sale 2012 – All Merch 50% Off! Click here to get your merchandise for half off at StrangeMusicInc.net! 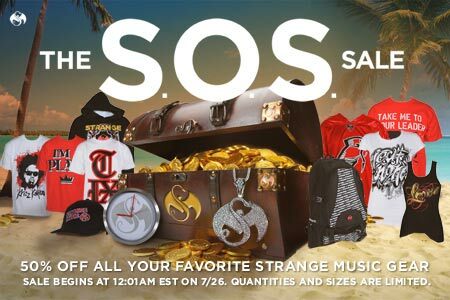 This Summer has been a hot one, but Strange Music wants to make it even hotter with the S.O.S. (Summer Of Strange) Sale! For a limited time you can get all your favorite Strange Music gear for 50% off! Don’t let this opportunity pass you by – get all the Strange Music t-shirts, hoodies, hats and more of the goods you’ve been wanting for 50% off. Remember: quantities, sizes and styles are limited and once they’re gone, they’re gone! Get in on the Summer Of Strange sale and stock up on that must-have merchandise from Strange Music! Sale starts on 7/26 at 12:01AM EST. Does not apply to previously placed orders. Orders for items that are out of stock will be refunded.